This evening I am more reflective. With Anne away our flat feels eerily quiet: no Radio 4 bellowing out from our bedroom. I liked Radio 4 so much so that I introduced Anne to it seventeen or so years ago, because Terry Wogan droning in the morning did not appeal. Better James Naughtie et al on Radio 4. Discovering Radio 4 was her epiphanal moment and the rest, as they say, is history. Having spent more of the early afternoon making a tomato tarte tatin, my tastes for the evening are simpler. To qualify, simple for me! I will let you judge, dear reader. I took some pork belly slices and poached them in a liquor of chicken stock, garlic, ginger, spring, hot paprika and soy sauce to give them flavour and ensure they become less fatty. So far, so good. Once out of the liquor the belly slices need to be dried. During this time the rice can be soaked. Basmati rice, although expensive and more difficult to work with, has a much better flavour than the easy cook American rice. Once soaked for half an hour, washed and drained- water is added. Two parts water to one part rice. Cook covered at a high heat until it boils and then turn down the heat and simmer until the water totally evaporated. As I wait for the rice to cook, I can’t help think how social food and eating actually is. I can imagine why some people who live alone find it such an effort to cook. Do they really want to waste time cooking for themselves? Microwave meals, albeit, cannot be the answer either. I wonder what Anne might be doing. Probably she is still at the hospital, knowing that a ready meal awaits when she returns to her mother’s. Listening to me on the telephone later, rabbiting on about what I have been cooking and eating, won’t help. The experience would be more satisfying, with her joining me. Setting the world to rights as we eat together. With the rice ready, I set about grilling the cooked pork belly slices. The process should take about fifteen minutes. In the meantime, I will make my sauce. I strain and reduce the stock to intensify the flavour adding some cider. Once reduced by half thicken with cornflour and butter, seasoning to taste, which may mean adding a little sugar. The aromatic smell of the rice and the sauce pervade our flat. I think I will open a bottle of wine. Whilst never good to drink alone, the food would be complemented if I did. No need to be too decadent or self-indulgent, I can finish it tomorrow. “Tomorrow and tomorrow and tomorrow beats on that petty pace from day to day to the last syllables of recorded time…” Shakespeare’s As You Like It somehow seems more pertinent, more real now, than studying it twenty five years ago at school. Could I conceivably be turning into an old fart? Never… not me, although my hair is less of a mix of salt and pepper and more salt! Now the rice has rested on the heat I can put a fork through it and separate the grains. I am ready to serve. 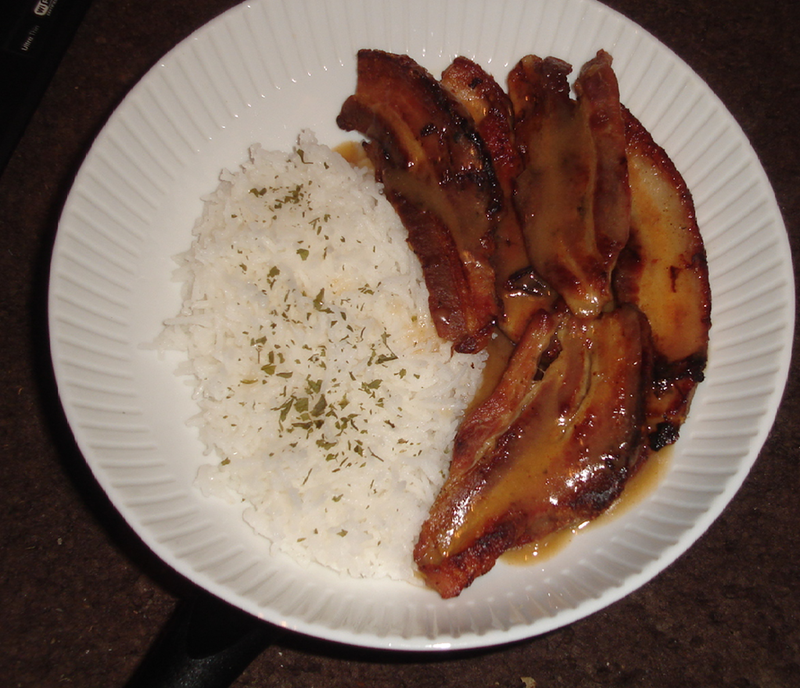 The cider sauce delicately coats the belly pork slices, and cuts the fat. The rice is subtle and the grains are separating perfectly, but this has taken lots of practice. Until recently all I could produce was a sticky, gluppy mess. The rest of the evening I will watch a romantic comedy, and imagine Anne and I are curled up on our settee, with me resting my head on her chest. I miss her more than you can imagine. Then “to sleep, perchance to dream”. Am I speaking to myself? I would like to hear your comments- on the food, something you find engaging in my posts.